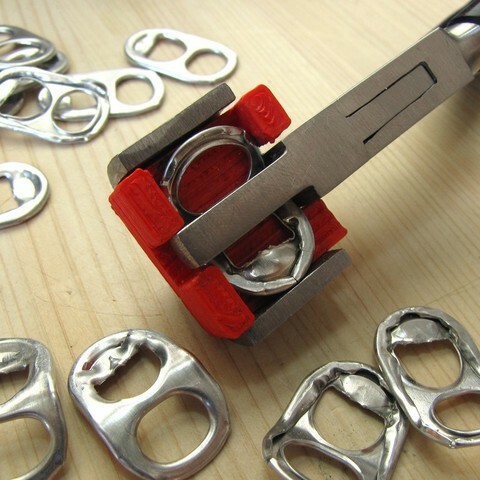 I have this trick of making chain mail with soda can tabs. The mail looks best if all the tabs are bent to exactly the same angle, which is very hard to do without a jig. So I printed this custom insert for a commercial pair of jeweler's forming pliers, which indexes and bends a single tab exactly the same way each time. Print on FFF platform of your choice. It fits in place of the factory nylon jaw in Rio Grande's Forming Pliers with One Nylon Jaw (catalog #111605 ) using two small ( #3 ?) wood screws through factory mounting holes in underside of jaw.